First collect vegetable scraps. I use things like onion peels, carrot peels and tops, chard stalks, celery stalks/tops, garlic that’s about to go bad etc. Be creative. 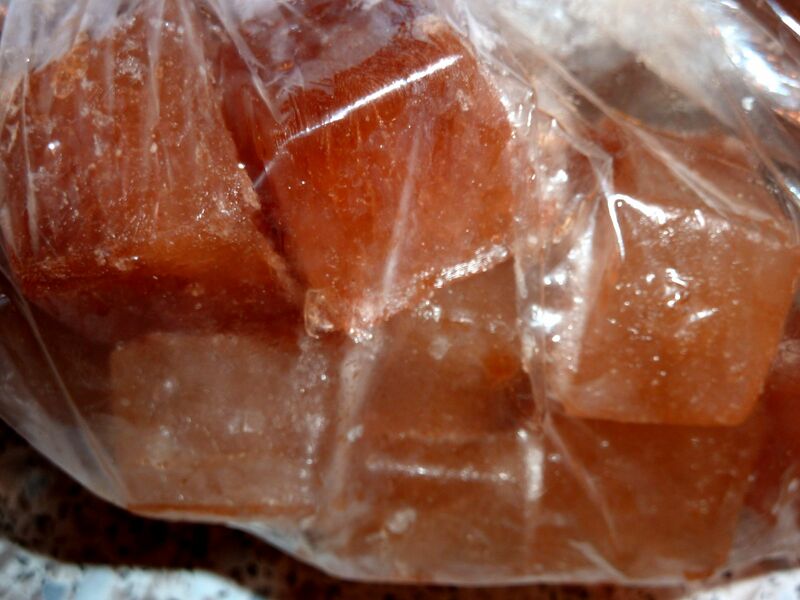 Freeze everything in an airtight container or ziplock bag. Once you’ve got enough to make broth, add to a pot. 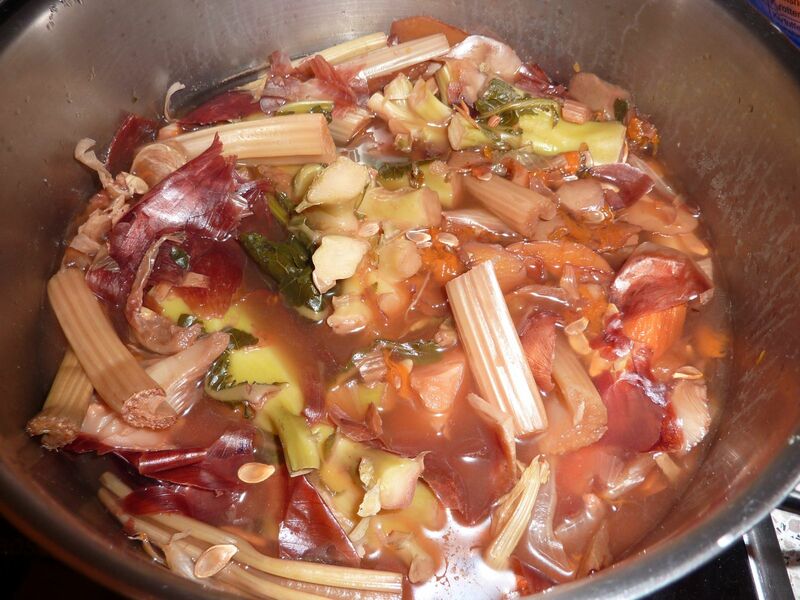 Add just enough water to cover most of the veggies, then simmer covered on low heat for about 1 to 2 hours. Once you think it’s done, meaning the broth took all the flavors and colors from the veggies, strain the broth (using a strainer or the lid) into a second pot. 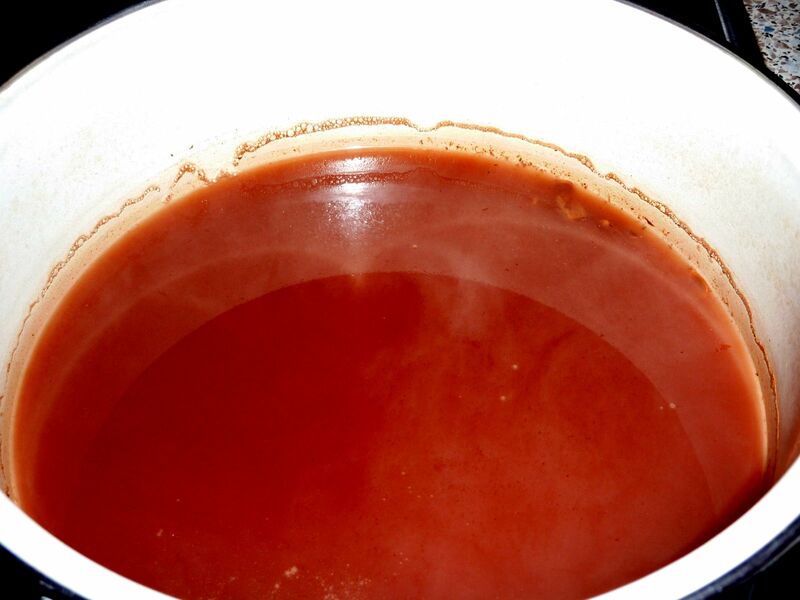 Reduce the liquid to about half by simmering on low heat (you can skip the step of reducing liquid if you want to, but it really concentrates the flavor). Let it cool. 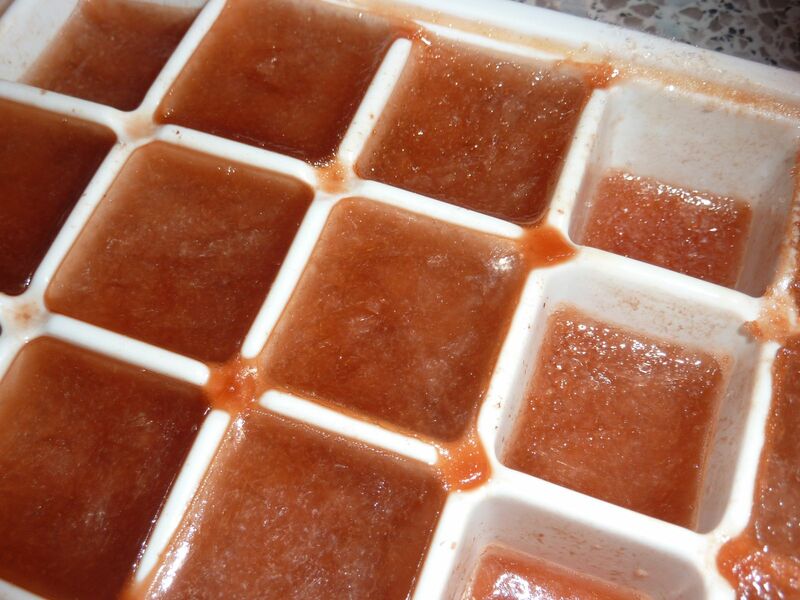 Pour into ice cube trays and freeze. Once frozen, you can leave the broth cubes in the trays or put them into ziplock bags. Broth cubes in ziplock bags. Will last a few months in the freezer. I made about one and a half trays of broth cubes this time, this will last me ’till I’ve collected enough scraps for the next broth. I use the cubes to add to sauces, currys, stews and about every recipe that calls for broth. You can also add it when cooking rice or other grains to enhance the flavor. 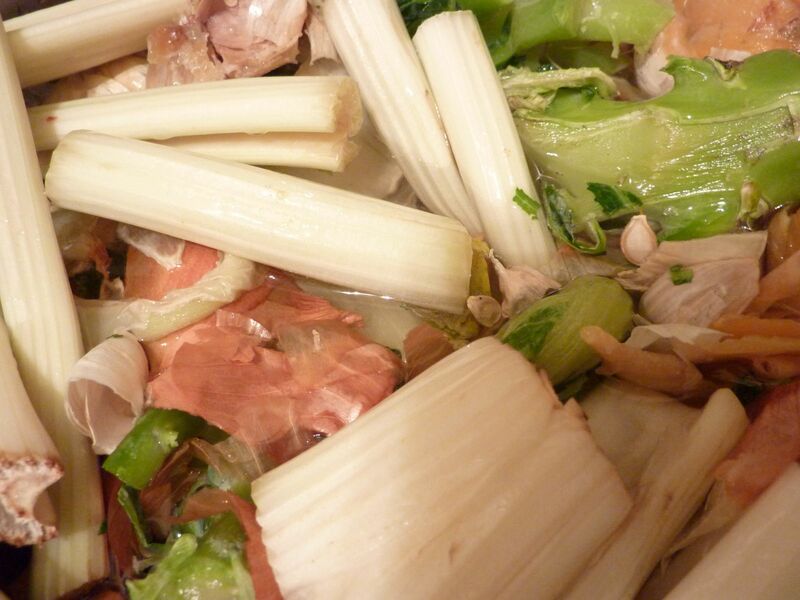 The broth will taste a little different every time you make it, depending on the veggies you’re using. 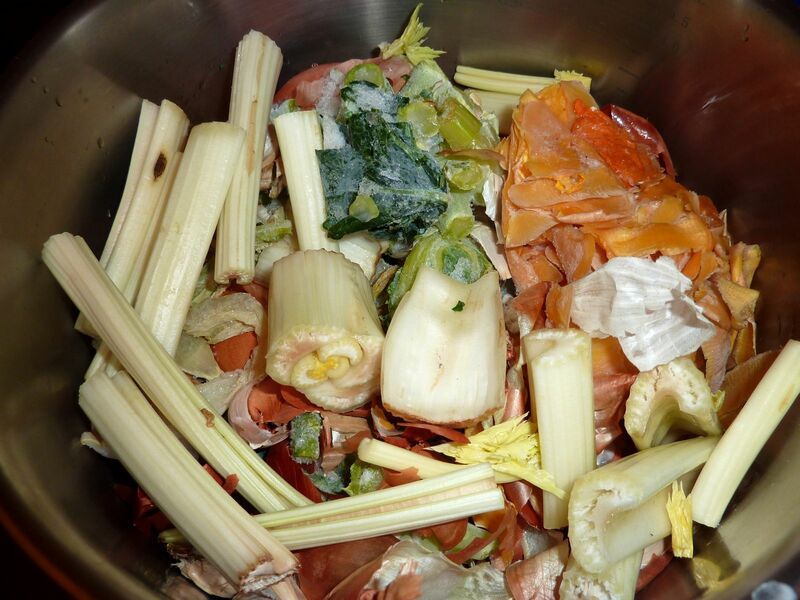 I have committed to not making veggie broth without garlic, onion peels and celery tops (or stems). Premise 1: Blogging is neither gonna take over my life nor am I gonna neglect it. Premise 2: A small post, e.g. a photo, is better than a long post that’s never going to get finished. Premise 3: Blogging – like everything else in life – is not a question of time, but a question of priority. Plants and gardening. While I’ve blogged a lot about edible plants, I’ll try to include ornamentals (especially indoors) as well. However, edibles will still be the focus. Growing, harvesting, pests, storing etc., maybe also some “plant portraits” reflecting what I know and my experiences with particular kinds of plants. I’d also love to write more about the challenge of small space gardening, garden design etc. But we’ll see whether that’s gonna work. Foraging. I’ve read a lot about it and done a tiny bit, but come spring, I’ll actually REALLY DO it. Focus will be on (sub)urban foraging. With foraging comes…. Cooking. I’m now on a paleo or LCHF (Low carb, high fat) kind of diet. During the last few years, I’ve put on way too many pounds and since late summer, I’m trying to loose weight – with some laaarge breaks due to an operation, busy days in university and Christmas. I’ve lost about 7 pounds so far, which is not a lot, but for an estimated 2 months of strict paleo, I’d say this is actually the most successful and best tasting “diet” I was ever on. I’ve read TONS about paleo/LCHF and now think that it’s the way to go. Not only if you want to loose weight. The hard part are the recipes, so I’ll try to post some here. I’ll also try to write about the paleo diet in general or at least refer to it every now and then. Book/movie reviews. Related to gardening, of course. Pretty pictures. Lots of them. Maybe also interesting pictures. But pictures. That’s it. Let’s see how it’ll turn out!